let’s look back to a rear mirror of 2010 with December’s reading list review. I must admit, it was pretty mystical experience. 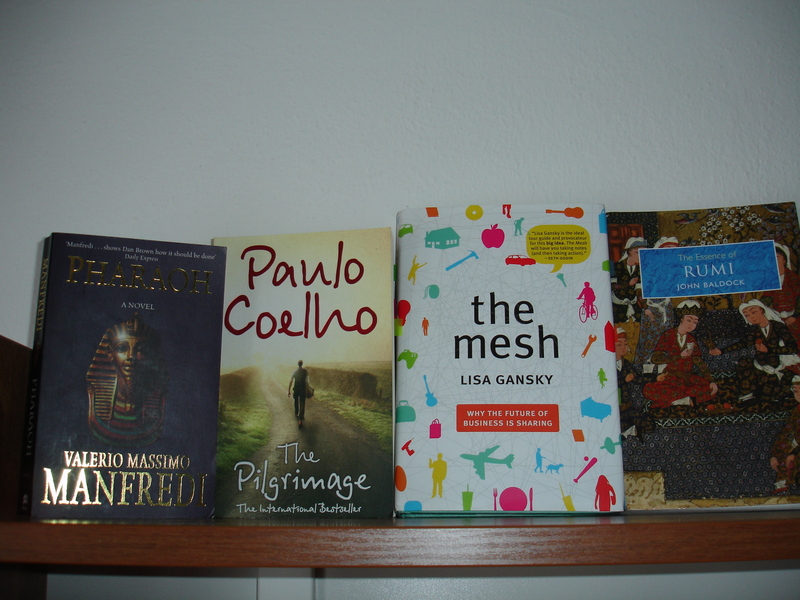 Lisa Gansky took me into the future of business with introduction of the mesh-y firms; which continued by “walking” the Pilgrimage journey side by side with Paulo Coelho and already challenged mind got even more stretched with essential thoughts of philosopher Rumi. I concluded last month of 2010 with thrilling fiction novel Pharaoh. Woa, what a ride! The Mesh is definitely one of the best books written in 2010 and one of the best business books I have ever read! John Baldock’s pickings of Rumi’s work was my first encounter with this great philosopher of Islam- Rumi. I have been noticing Rumi’s quotes here and there on Twitter or Facebook and they have always resonated with me. After reading this introduction to Rumi’s life philosophy, I am eager to read more about sufism, Islam and then carry on with other essentials on world’s religions. I believe it should be part of everyone’s education, in order to have respect to each others spiritual roots and beliefs. Reading adventure with Rumi was so intense, that it made me to write down 8 pages of notes… I strongly recommend you to read it carefully, guys! The soul of prayer is better than prayer; faith is better than ritual prayer. Faith without prayer is beneficial. Whereas there is no benefit in prayer without faith. A pure heart is without doubt like a polished mirror, open to receive an infinite number of images. For the Sufi, who is the “child of present moment”, the goal of our journey does not lie at some distant point in future, it is forever present. Be extremely humble, greet the other first. Whoever is loved is beautiful, but reverse is not necessarily true, it does not follow that anyone who is beautiful is loved. A bird flies by means of its wings; A believer flies by means of his aspiration. The company we keep – who we are drawn to and who avoids us also reveals our inner quality. Who are you running away from? From ourselves? How absurd! From God? How criminal! There are two kinds of intelligence: First kind you acquire through learning in the manner of school children from books and teachers. Second, unlike first kind of intelligence, the water of divine knowledge never stinks with stagnation. It does not matter if it is prevented from flowing into the outside world, for it pours forth from the heart in unending flow. I wish you to be in the flow, guys! Always! I loved the Mesh, too. I am working on a new Meshy idea of banding householders together to get better deals on house maintenance. Around here it can be hard to even get a contractor to come to your house to talk to you, let alone get any work done. That’s because most jobs are too small to be profitable. If we can batch up work, we can hire people to get it done and still be profitable for them. The Mesh is a great book to read while you think through any business idea because it has practical ways to make any business Meshier. I have no doubt, that you too are fan of the Mesh. As it was said on the cover by Seth: The Mesh will have you taking notes and then taking actions.>>> and that is precisely what you do! > A bird flies by means of its wings; A believer flies by means of his aspiration. I like that. Aspiration has lift off. U trust you have got “high” through aspiration many times, haven’t you? I guess, I’ll add “The Mesh” to my wishlist of more than 65 books. Many of them are from your recommendations and those which I’ve already read were great. Currently I’m going throught “Power of Now” by Eckhart Tolle. It’s interesting that it’s not on your list here on your website. I find it to be the best book I’ve have read, together with “Think and Grow Rich” by Napoleon Hill and “Psycho-cybernetics” by Maxwell Martz, which aren’t on your list either. I really recommend them, but it’s hard to believe you haven’t read them yet. I consider them to be the most important books about personal development. Welcome, welcome to our SCG! ;-) You will be listed as first in the SCG Vol.5! I have read Tolle’s and Napoleon Hill’s books sometime in 2007/2008. List which is on #IS is only from years 2009, 2010. Thanks again for joining our conversation and thanks for tips.